Let's analyze a core IRA porftolio candidate that can help build your returns, year after year. Some companies are so ubiquitous, and exhibit such an almost boring longevity, that we often overlook them when assembling a portfolio for the long term. But these are just the types of anchor securities you should keep in a diversified IRA account. 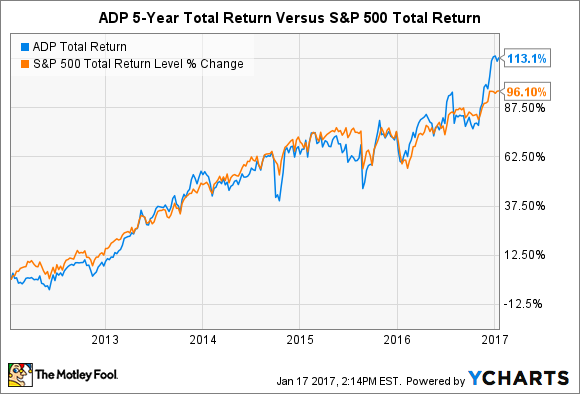 An essential holding you may not have considered for your retirement portfolio is Automatic Data Processing (NASDAQ:ADP). Automatic Data, or ADP, as it commonly refers to itself, is a worthy component of your tax-deferred investing game plan, whether you're retiring in five years, or 40. Debuting on the public markets in 1961, ADP scaled its revenue over the years as a business process outsourcing, or BPO, provider, chiefly in the area of payroll. Its breadth and experience in payroll is still a primary calling card -- most investors are familiar with the respected "ADP National Employment Report," which predicts U.S. job growth in advance of the U.S. Bureau of Labor Statistic's own monthly employment figures. Today, though, ADP describes itself as a provider of "Human Capital Management," or HCM, solutions to employers around the world. HCM as a concept encompasses both traditional BPO services as well as the delivery of cloud-based software that facilitates the management of employees. Increasingly, HCM software is the very tool through which business process outsourcing services are delivered. ADP functions within two reportable business segments: Employer Services and Professional Employer Organization (PEO) Services. The main revenue streams in Employer Services illustrate the activities associated with Human Capital Management. These include the services of payroll, benefits, employee acquisition, human resources (HR), and employee time management / attendance tracking. It also includes corporate level, employee-related services like insurance, tax, compliance, and retirement services. Employer Services accounted for roughly 78% of ADP's total fiscal first-quarter 2017 revenue of $2.9 billion. While much smaller, the PEO Services segment is growing at more than twice the rate of Employer Services. PEO Services is a leader in the PEO industry, in which outsourcing providers enter into contractual "co-employment" agreements with corporations. In these agreements, the PEO provides dedicated HR and administration services, while the corporation retains day-to-day management control over its employees. For an information technology company now in its sixth decade, ADP still has the capacity for very decent and steady top-line growth. It has achieved a 7% revenue compounded annual growth rate, or CAGR, over the last four fiscal years. I'm particularly attracted to its global reach and potential. As of ADP's most recent fiscal year-end of June 30th, 2016, the company reported having 650,000 clients in over 110 countries, with no single client or affiliated group comprising more than 2% of annual revenue. This type of entrenchment bodes well as the global economy expands and creates more jobs. Of course, recessionary periods pose a risk to ADP, but the growing PEO Services segment may provide some buffer against a potential downturn since it allows medium-sized companies to cut administrative costs. In short, PEO Services may very well pick up momentum if the worldwide economy falters. Various stability factors enhance the appeal of ADP for retirement portfolios. The company cites a retention period of 11 years for its typical Employer Services client, and seven years for its typical PEO Services client. Impressively, ADP derives roughly 3% of its total revenue from simply collecting interest on the client funds it holds each day in its accounts in order to fund outsourced payrolls and related tax payments. ADP Total Return Price data by YCharts. Automatic Data has outpaced the overall market on a total return basis over the last five years, while remaining consistently less volatile. It currently exhibits about 80% of the total market's volatility. ADP's beta has been as low as 0.625 and as high as 0.925 during the period, but it's never exceeded the market's beta of 1.0. In other words, more return, less risk. 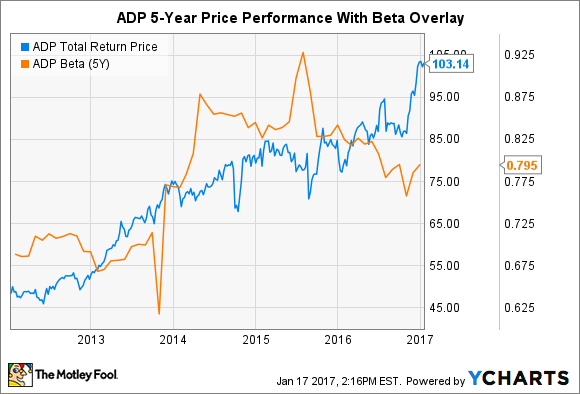 I believe ADP's solid and expanding earnings and cash flows, backed by a long history of consistency, are rewarded as investors seem to buy the "ADP" symbol in both rising and correcting markets. Thus, ADP provides IRA investor with a handsome, tax-deferred total return alongside relative safety -- two traits that often prove vexing when you try to locate them in the same security.